Crisp whites and pale creams mixed with greenery make this a truly beautiful bouquet. 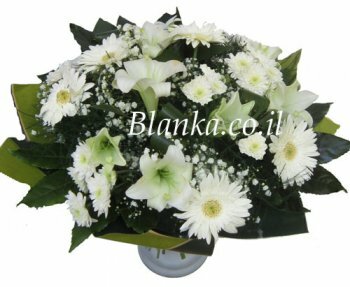 In the picture you can see white lilies, gerberas, chrysanthemums. Flowers will change depending on seasonal availability but the look will remain the same. Lovely birthday flowers, thank you flowers, I'm sorry flowers, sympathy flowers. In fact suitable for all occasions.